Are you preparing for OET? Then you need to know the preparation process thoroughly and must be aware of the areas that contribute to the better results. For this, your preparations must be flawless and must be devoid of mistakes that candidates often commit. BAFEL takes special care about such mistakes and coaches the students in the right direction so that they come out with flying colors in the OET and outshine in their future with a brilliant career. Mentioned below are some of the mistakes that OET aspirants commit while preparing for the exam and often lead to a poor result. Poor Grammar: Grammar is an important aspect in OET. 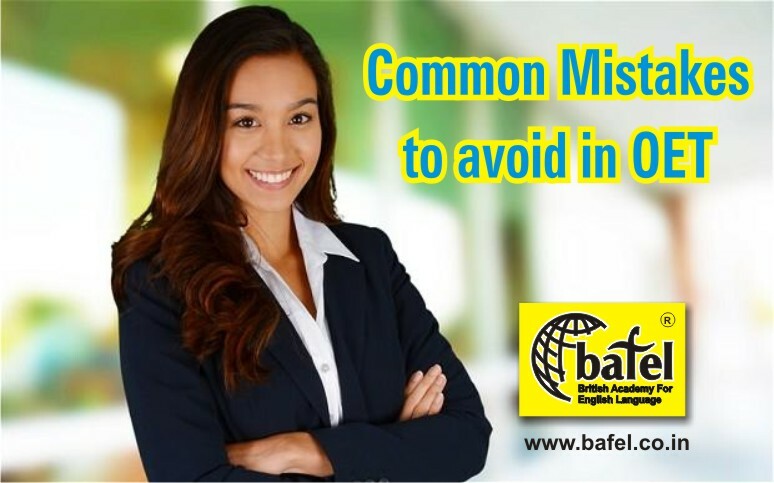 When learning English, or any new language, the amount of grammar mistakes is relatively high. And if the sentences have errors of 50% or more then, the candidates often lose their marks for grammar and accuracy. 25% of the scores, in OET, are based on grammar structure in the writing and speaking subtests. As a thumb rule, your sentences must be free from grammatical errors, at least by more than 50% in the exam. Spelling and Punctuation:To make your work presentable, one needs to be aware of correct spelling and punctuation. Double-checking the spelling and punctuation errors often helps to correct those errors in spellings. And placing the right punctuation portrays a clear understanding of the language in front of the examiner. Proof reading once always helps to clear such errors at the end of the exam. Layout: OET requires the candidates to write different letters for official purposes. Using the right layout reflects that you understand the intent of the letter. It shows that your letter conveys a clear communication of your idea, information and advice to patients, doctors and other medical practitioners. Hence, care must be taken to choose the correct layout in the writing test. Reader’s Viewpoint: Always consider how the reader is going to interpret your writing. The reader always dictates the language used by you. For example, a patient will not understand medical terminology and hence your language must be devoid of any complicated medical jargon. If there are complicated terms, then it is necessary to spell them out to the patient so that they have a good understanding of the medical process. This must be reflected in the OET writing tests. Length: While writing paragraphs, use a layout allotted for the context of the test. Writing in an essay format can clutter what you need to convey. This often leads to confusion. Using words that precisely convey your information to the reader helps to have a clear picture in their mind. One of the ways to be precise is to discuss just one point in one paragraph and move to the next. This will give clarity to the reader without any confusion. Precise elaboration: The content must reflect the information you want to convey. Be it writing or presentation test, lengthy elaboration is a poor substitute to precision. In the medical field you will have little time to convey what you want, like in a case of emergency, so a precise way to communicate must be reflected in the test also. BAFEL prepares OET aspirants to get the topmost grades and marks in the OET. It is meant to build your writing, listening, reading and speech skill sets for the exam. Enroll with us today and prepare for the best scores and a shining career ahead with BAFEL.